Peritas was a much-loved dog of Alexander the Great (356 BC-321 BC). Apparently there were two dogs of Alexander named Peritas. 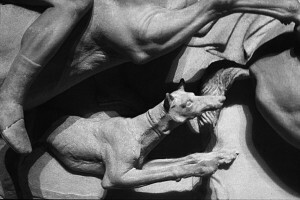 One he raised himself Plutarch writes, “he also, we are told, built another city, and called it after the name of a favorite dog, Peritas, which he had brought up himself.” This dog might have been a greyhound type.